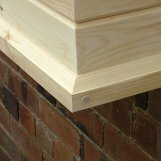 Lincoln window boxes are made from Scandinavian red pine, supplied with our easy to install, concealed wall hanger (together with all the fixings), plus holes in the base for good drainage. 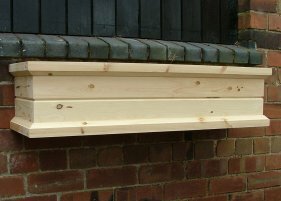 If you prefer we can supply it with a plain back to stand on the windowledge rather than hanging from the wall or fence. Just make a note in the 'special instructions' box on the way to checkout. 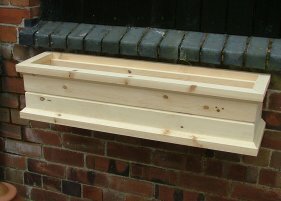 A window box for the fragrance and flavour of herbs. Herbs enhance so many dishes: grow your own favourites and keep them fresh to hand close to your kitchen. Mixed herbs look pretty and provide delicious fresh additions to salads, soups and all kinds of other dishes. With a window box in a sunny spot outside the kitchen door it is easy to snip a sprig of sage or a handful of fresh basil for your cooking when you need it - in fact, using herbs is the best way to keep the plants bushy and compact. A window box of herbs also makes an attractive and aromatic feature beneath your window, so choose varieties that will give a mixture of colour, scent, shape and flavour. A herb window box hold a variety of herbs. variegated lemon balm, lemon thyme, common and golden, marjoram, oregano, peppermint sage and white horehound, around the sides. In the centre try chives and silvery curry plant. Grow herbs in a window box outside your kitchen window is a way to keep herbs close and handy for the kitchen. Dill, basil, prostrate varieties of rosemary and thyme all work well in culinary window boxes where they tumble over the edges. You can plant more densely in window boxes than in the ground. When leafy herbs die down in autumn, you may want to replace them with more wintry flavours, such as rosemary and sage.